While once a strong alternative to physically mailing letters, high-volume email campaigns have become more difficult at the national level. Most Congressional offices now use web forms and other filters to restrict the flow of email to their inboxes, minimizing their impact. The majority of midrange and higher-end tools are able to navigate these roadblocks, but it’s a game of cat and mouse; as the email tools become more effective, so too do the defenses. For those with expansive needs and more substantial budgets, a number of high-end tools provide strong, advanced features — for a cost. These tools begin at around $1,000 per month. For instance, Blackbaud Sphere and Convio are fairly widely used among large advocacy organizations and combine advanced email advocacy capability with robust online features and constituent tracking. 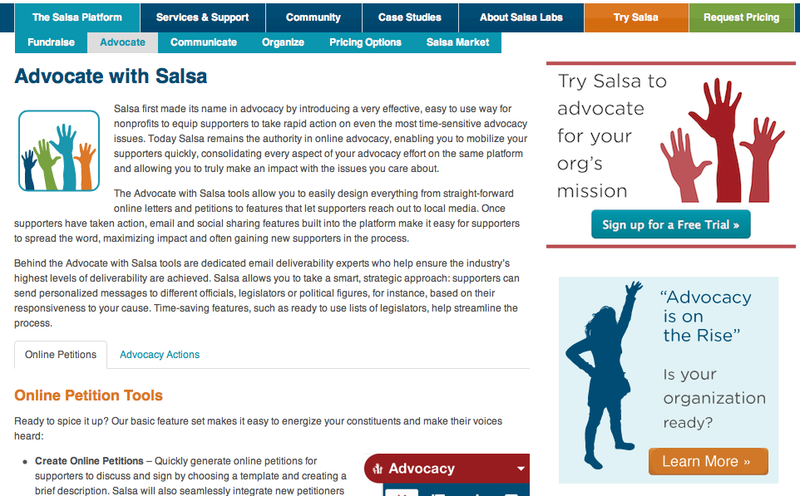 Several newer options from major advocacy consulting firms include ActionKit, put out by We Also Walk Dogs (which is closely associated with MoveOn.org), and a built-to-order offering by Blue State Digital. Most website Content Management Systems (CMSs) — like Drupal, Joomla, WordPress or Plone — provide the ability to create email website forms. 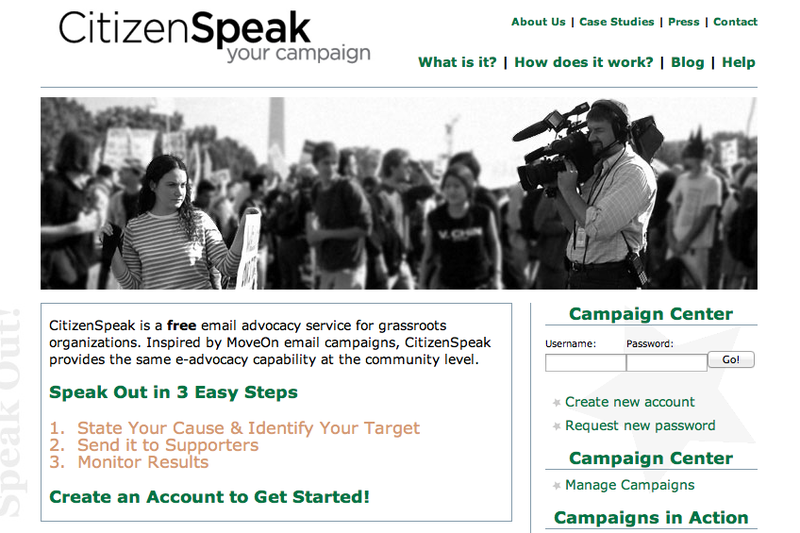 You could pre-populate the form with the text of an email for supporters to modify or personalize, a method very similar to CitizenSpeak in functionality. This option has the advantage of being easily branded for your organization, and is fairly easy to implement. However, it relies on your CMS’s broadcast email functionality, which might be less reliable than other options included here. Congress has typically been more responsive to phone calls than emails, and staffers are more likely to answer a phone than reply to — or even read — an email. Technology is emerging that will allow your supporters to make a phone call by entering their phone number on your website and clicking a button. The tool will then call their phone to connect them with your campaign target. There’s no well-known software that’s available out-of-the box to provide this functionality, but consider Twilio if you’re able to work with a program to implement an application programming interface, or API, which is basically a way for websites to access data from another site. Remember, because corporations have more at stake to protect the image of their brand, they are more likely to respond to campaigns. 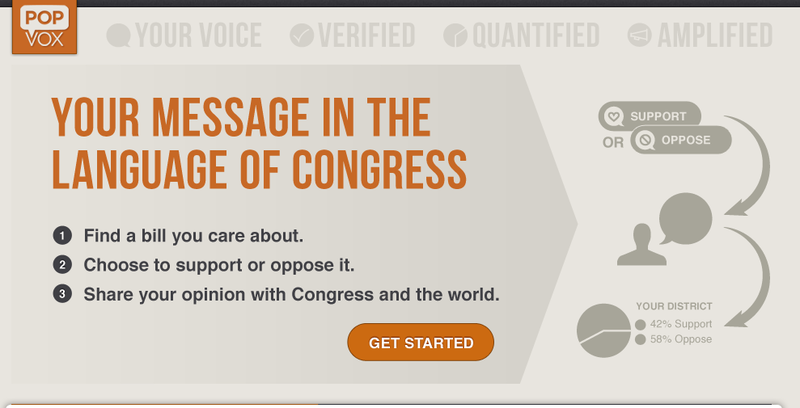 While your supporters can take action directly on Facebook, or using hashtags and retweets on Twitter, some purpose-built tools have emerged to help with these efforts. 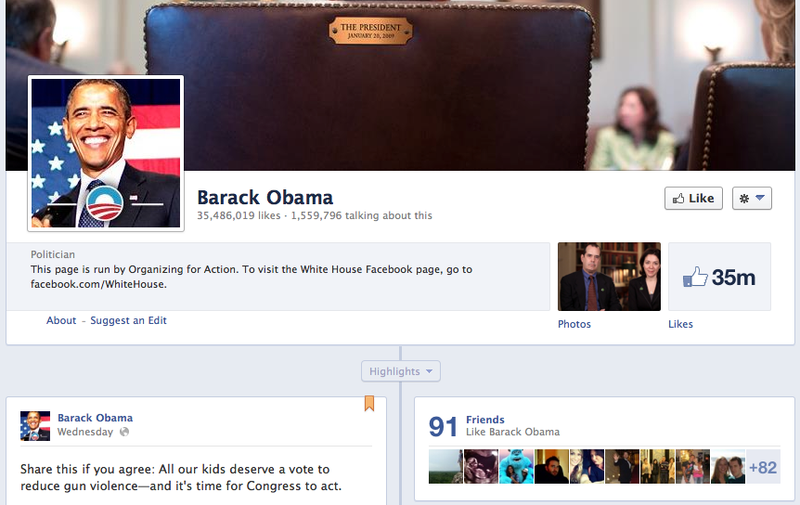 For instance, Act.ly provides a free tool that uses Twitter to target politicians and corporations. To learn about different ways of conducting petitions and pledges online, read our article, A Few Good Online Petition Tools. To learn about advocacy in the age of social media, read Influencing Public Policy in the Digital Age: The Law of Online Lobbying and Election-Related Activities. This article originally appeared on Idealware and is republished under a Creative Commons Attribution NonCommercial No Derivatives 2.5 license.